Led by singer/songwriter/producer powerhouse Jamie Hoover, The Spongetones have been making essential power pop records since the early '80s. "Odd Fellows" includes more of their finely crafted, hook-laden punchy rock originals and a cover of The Everly Brothers hit "On the Wings of a Nightingale" (penned by Paul McCartney). 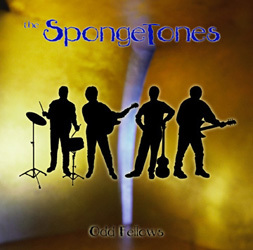 What can one say about the Spongetones? Quite a lot, actually. More than I could possibly ruminate on in the allotted space of a measly one-sheet. Pop Gods? Merseybeat masters? Once upon a time. A fun-loving bunch of good 'ol Southern boys who sound nothing like .38 Special? You bet your life, Groucho. I could mention that the 'Tones have been in-crowd with pure pop fanatics ever since the early '80s, when their fab one-two punch of "Beat Music" and "Torn Apart" neatly updated the sound and style of the early Beatles without resorting to geeky mimicry. I could go on about subsequent records, like the cooler-than-cool "Where-Ever-Land," whose leadoff tune, the crazy "Forget About May," somehow managed to combine folk, punk, and Merseybeat cohesively. Or maybe their cheekily titled, mid-'90s opus, "Textural Drone Thing" (which certainly was textured, but minus any measurable drone), which brought some stylistic expansion and echoes of the Zombies to the Spongetones' merry pop party. Oh yeah, can't forget 1991's "Oh Yeah," which saw a slight return to the Beatley days of yore while gently shoving the 'Tones' sound into the here and then. I could blab about how these four ace musicians -- Jamie Hoover, Steve Stoeckel, Pat Walters and Rob Thorne -- used to inspire young girls to want to purchase bottles of their perspiration during the band's early days (I don't make this stuff up, folks). Oh, and the four aces write, sing and play pretty damned good, too. Finally, I could tell you about the boys' new one that you're about to spin, called "Odd Fellows." It rocks. It pops. It's where old meets new. Where melody and harmony collide, but no one gets hurt. Where the Spongetones offer you, dear listener, some of the finest songs they've ever tracked. Where four Liverpool-lovin' dudes from the South finally realize a dream and record a song by Sir Paul McCartney himself ("On the Wings of a Nightingale"). Anyway, give "Odd Fellows" a listen or eight and see if it doesn't grab you like many of your favorite records do. Me, I'm still listening fervently while trying to imagine what in the name of Ringo anyone would do with Spongetone Sweat.